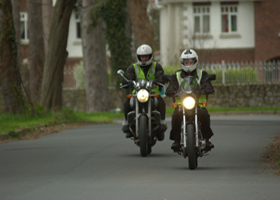 For those bikers who already have a licence but may not have ridden for a while, we offer refresher training designed to ease you safely back into the wonderful world of motorcycling. Sometimes called ‘rusty rider’ training the aim of this training is to refresh and build the skills of a rider to the point where they can be confident and safe on the public roads. As all riders already have a full bike licence these courses are flexible, designed to cover any areas of your riding skill which may be causing you concern. Whatever the course, you can rest assured that you are being trained by some of the best and most highly qualified instructors available. Why not get in touch and take the first step in passing your motorcycle test or improving your riding skills?